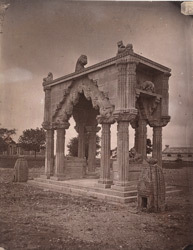 Photograph of the gateway in front of the Teli-ka-Mandir at Gwalior, in Madhya Pradesh, taken by an unknown photographer around 1882, from the Archaeological Survey of India Collections, taken by Bourne and Shepherd in c.1883. The Teli-ka-Mandir is a Hindu temple built in the middle of the 8th Century during the Pratihara period. The temple consists of a rectangular sanctuary covered by a masonry tower with a vaulted roof. Projections in the middle of each side of the tower continue those of the walls beneath. The niches on the outer walls are empty but the doorway is decorated with carved figures of river goddesses, amorous couples, foliation motifs and a flying Garuda on the lintel. The gateway in this view was situated at the entrance of the sculpture garden which was set up during the restoration works.